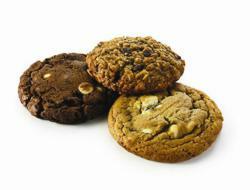 For most bakeries, commissaries and large baked goods manufacturers, cookies are a staple offering, always a favorite with customers. Depending on size, market and operational capacity, a bakery could be producing a few hundred to a few thousand cookies a day. Unifiller's newly launched Mini-Dopositor helps bakeries optimize their cookie production, while reducing personal injuries and product waste. How much cookie dough does a baker scoop before feeling that familiar ache in their hand? Or the pinch in their pocket? For most bakeries, commissaries and large baked goods manufacturers, cookies are a staple offering, always a favorite with customers. Depending on size, market and operational capacity, a bakery could be producing a few hundred to a few thousand cookies a day. According to Jamie Bobyk, a former banquet chef "Cookie dough scooping involves force applied against the wrist in grasping the handle of the scooper against the dough, and force applied by the muscles in and around the thumb when releasing the scooper. Scooping - everyday, for hours a day - can lead to personal injuries like carpel tunnel syndrome or tendonitis, detrimental to overall health and long term well being." That’s where a cookie cutting machine could prove beneficial. Investing in a cookie dough depositor means the machine does all the portioning and cutting work allowing bakery staff to focus on other production activities. Unifiller’s newly launched Mini-Dopositor can handle cookie production with or without inclusions, bake and break, gourmet and gluten-free cookies, cookie dough pucks, brownie and bar depositing. It can additionally portion food products such as meatballs, burrito fillings and meat patties. What’s better the dopositor fits the budget and space requirements of smaller bakeries wanting to slowly amp up their cookie production.Unifiller also offers a standard dopositor suitable for mid-sized volume and a HD dopositor ideal for wholesale and high volume production. Check out this and more at Unifiller's Booth 323 at Bakery Showcase in Mississauga Ontario, May 6-8, 2012. For more information conact info@unifiller.com.